David Botham is a travel agent. He has a woman he loves, gets along well with his parents and considers himself ordinary. He has peeves and problems, of course, but don’t we all? David is also a member of a writing group but doesn’t really consider himself a writer. Recently, an uncontrollable burst of anger got noticed by another member. Pushed for a title to the proposed piece, he calls it Better Out Than In and forgets the whole thing. A few days later, however, David learns that someone has appropriated his title and is writing a blog in which he rants about people’s thoughtlessness. David doesn’t care. Let the unknown author rave, but then he notices that the people written about are uncomfortably recognizable as to persons he knows. An unprosecuted stalker falls down an elevator shaft and is killed. A loudmouth in a movie theater and a shop assistant who prefers to talk instead of waiting on customers come to gruesome ends. David gets the uncomfortable feeling the blogger isn’t just complaining. The blogger signs himself “Mr. Lucky.” David doesn’t care that he stole his title but using that name is too much of an eerie coincidence. Is it possible this blogger is his Lucky come to life? Is he targeting people who’ve annoyed David because David doesn’t dare? Something he learns a little later makes David certain he and Lucky are connected. He isn’t his parents’ only child. There was a brother who didn’t survive. Is Lucky that unborn infant, acting out because the sibling born in his place won’t? No matter who Lucky is, David knows there’s only one way to stop him and he has to do it. Think Yourself Lucky is a difficult book to read. Not in sentence structure or word use but because each bit of dialogue appears couched to gibe, insult, or provoke. Often the characters seem to be speaking at cross-purposes, not even talking about the same subjects. Some of the sentences give the impression of being so out of place they may have to be read several times to get their actual meaning. As a writer’s artifice, this is a deft method of pointing out that at, at their best, humans are self-centered and uncaring of whom they hurt with their words. Nothing else matters as long as each voices his own opinion, which is, dogmatically, the only one. It follows that most of the characters are generally unpleasant, even the nice ones, showing one face to David and another to each other. Even David isn’t exempt from this and gets in his own verbal jabs whenever he speaks. The title itself also has a double meaning as, at the end of the novel, Kinnear tosses the phrase at David. Does it mean David should literally think he is Lucky, the author of the atrocious blog, and there’s irony there, to be sure, or should he merely consider himself fortunate that he’s working when so many others aren’t? Once Lucky’s identity is discovered—and there’s dichotomy there, also, which is he, unborn brother or made up childhood friend?—David’s course of action is rigidly ordained and without choice. 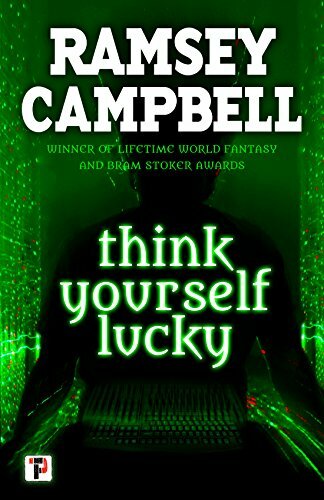 Mr. Campbell’s current novel is disturbing different, a story exploiting the occasional feeling that a person’s actions are controlled by a darker soul within. It also carries the warning: Be careful what you say because it will eventually turn on you. Think Yourself Lucky is a cautionary tale of psychological horror, offering the sad solution that in order to contain a monster one has to become that monster.